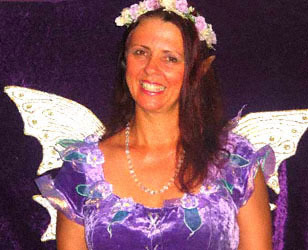 With our talented Fairies, Clowns, Pirates and Magicians, and colourful Christmas Fairies and Elves. Gypsies Celtic Wood Elves & More! 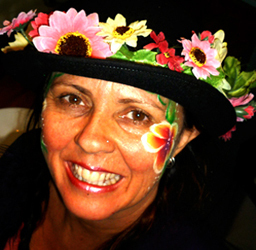 Our most popular package includes a colourfully costumed Entertainer who will Face Paint truely Artistic designs using quality cosmetic grade Face Paints that don't itch or irritate ( I am the Queensland distributor), a Pass the Parcel, Lollypop Treasure Hunt, Fabulous Balloon Twisting and themed and age appropriate games with prizes for up to 15 children for 2 hours of jam packed fun! The structure may vary according to numbers, and of course your own ideas. All of our highly trained and exprerienced Entertainers have Blue Cards ( Govt working with children suitability check), Public Liability Insurance and big smiles! 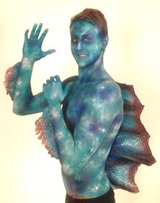 We do spend money to continually improve our Face Painting techniques by training with overseas Master Artists like Brian & Nick Wolfe, Jinny and Mark Reid, and offer a unique range of characters and costumes. 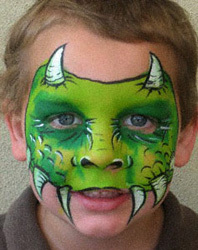 Want a fun filled party for your son that everyone will be talking about for years to come? Invite our Pirates- Mad Mick the Balloonatic and Captain Sam, who Facepaints a storm. 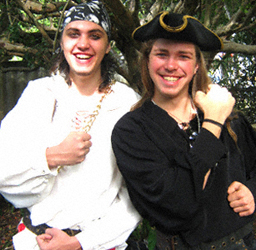 These lads grew up Pirating and have clocked up 10 years experience between them, including bookings for the Australian Socceroos, Gold Coast United, Brisbane Lions, Pacific Fair, Anaconda Rapid Ascent and Kellogs Ironman to name a few. Together they will Entertain the kids and provide a very Piratey Party with Face Painting, Balloon Swords, a Treasure Hunt, and Pass the Parcel while Sam plays Pirate jigs on the Viola. Craft parties are another option for smaller groups- plaster painting, paper flower making and magic wand decorating- evryone makes a gift to take home! 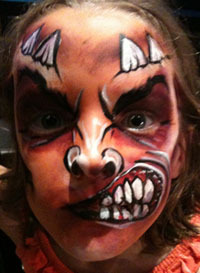 The team from Always Wicked Art entertain every Friday and Saturday night in the Kids Club at Benowa Tavern, Bundall and Norfolk Tavern at Ormeau. 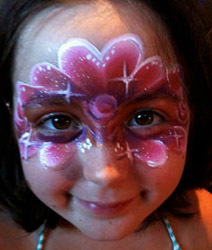 Come along for a relaxing dinner while the kids enjoy free Face Painting and Balloon Twisting! 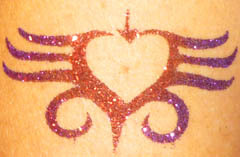 Glitter Tattoos are sparkley, colourful and waterproof, so are fantastic for pool and dance parties as they will not sweat or wash off. They last between 3 and 7 days approximately and can easily be removed with alcohol wipes or baby oil. 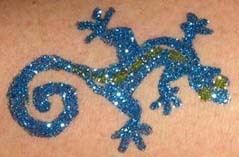 We have a fabulous range of designs for boys, girls and adults, and a great choice of available glitter colours. 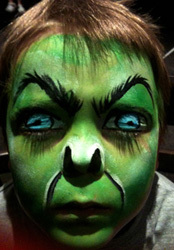 Always Wicked Art also offers Temporary Airbrushed Tattoos for pool parties, Piniatas, Magic Shows, Plaster Painting and Craft Activitiess. We have it all! 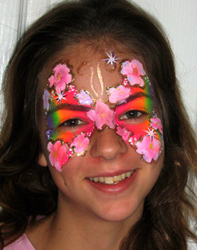 Cheap Facepaints can crack and itch, irritating the skin. Beware of anyone using acrylic paints, as non-toxic does not mean safe for your child's skin, just that you won't die if you eat it.It can still cause a rash or irritation. We always use quality cosmetic grade products and clean water & sponges. We have Blue cards and Public Liability Insurance.